Rupert Grint is an English actor who rose to his prominence with his role of Ron Weasley in Harry Potter film series. So if you are searching for Ron Weasley quotes, now you don't have to search for them anymore. As here I have compiled down some of the best Rupert Grint quotes. 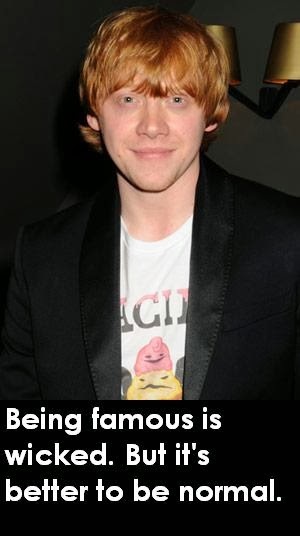 Just hope you will like the quote compilation and able to find some good Rupert Grint quotes to share with your friends. Art was a subject I excelled in [at school], and I really like drawing caricatures. Don't have a favorite subject, I think I want to carry on doing this because I really enjoy it. I am quite into comedies, so I wouldn't mind doing an animated movie. It would be quite cool to do the voices. That would be different." Looking back at all the films, it just seems like one long film. To act scared, I think of something scary, like maybe a teacher I had. Although then I might get too scared! Walking into the great hall for the first time was absolutely incredible...it was just incredible, it was the most amazing thing I've ever seen in my life.